Leslee's Creative Inspiration: Ready for Autumn? Happy Tuesday to you! What a wonderful day the Lord has made!!! Of course, He does have a sense of humor. The boys headed back to school today. We had no major issues other than the unknown location of Adam's umbrella. I let him use mine. Yes, it is raining! In that is God's humor. You see, He knows just how much I've been looking forward to the boys heading back to school and me getting back into a routine (having the house to myself)...well, He sends the rain and I have hubby Don home today. Hmmm....so much for my plans....God has other plans for my day. That's okay! It's been awhile since Don and I have spent a day together without the kids! So, I look at today as another gift from God! I hope you see your daily gifts too. Is it just me or has anyone else noticed that once the kids go back to school the weather turns cool pretty quickly? It has been a hot summer and I'm ready for the cooler days of autumn. The guys and I went camping in our own backyard over Labor Day. We pitched the tents, had a campfire, roasted hot dogs and marshmallows, and enjoyed the crisp evening air by the fire. For me, it was chilly and I ended up in long sleeves. Once back at my desk, I wanted to capture that autumn feeling in my card. The Autumn Harvest set is simply a go to favorite! I love using it for water coloring and masking. And that's just what I did here. Do you like it? 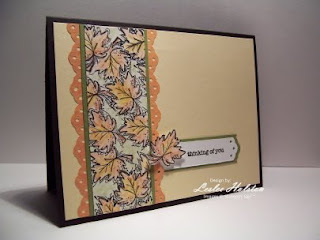 The layout is the Fall-to Layout #52 found over at the Clean & Simple Stamping blog. The leaves are stamped on Whisper White cs in Jet Black StazOn ink and masked to give it that layered depth. I used my water colored crayons and an Aqua painter to color my leaves. The image strip is layered onto Old Olive and a scrap strip of Razzleberry Lemonade DSP...all found on my desk. Yes, I'm still trying to use up my scraps! The sentiment is from Teeny Tiny Wishes. I simply punched the end of the sentiment panel using the Eyelet Border punch. I like the look. An extra leaf was stamped, colored and placed on a dimensional over the sentiment panel. All is adhered to the Barely Banana cs (yet another scrap) and layered onto the Basic Black card base (which was in my stash of pre-cut and scored card bases). So, are you ready for autumn? Whether we are ready or not...I think it's here! Have a great day! Thanks for stopping in.